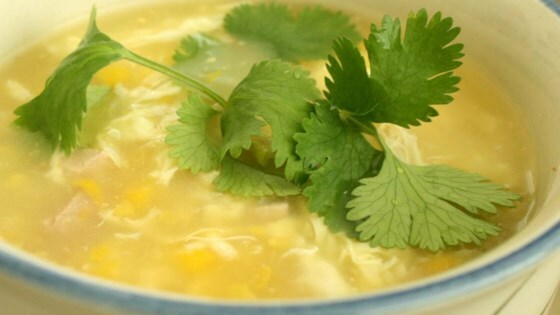 "This is a quick and easy way to make this soup that is usually served at Chinese restaurants. For a tangy/hot flavor try this: about 3 to 4 hours before serving combine 1/4 cup vinegar and 3 finely chopped green chilies. Refrigerate until serving time and then sprinkle about a teaspoon of this on the soup. Enjoy!! Garnish with fresh scallions." In a medium stock pot combine broth, corn and chicken. Bring to a boil, reduce heat and add pepper and salt. Bring back to a boil. In a separate bowl mix the corn starch with water. While the soup is boiling add this mixture, and stir constantly until well mixed. Season with sesame oil by adding a few drops at a time. Reduce heat, and slowly add egg white while swirling the soup with a fork in order to break egg pieces apart. Add chopped scallion to garnish, and serve hot. This classic chicken and noodle soup is simple and so satisfying. We did not care for this recipe. Made as directed in the recipe. The kids all liked it. Instead of chicken, I would use crab meat for variety. Thank you for posting. Very good! I followed the directions exactly and it turned out great. Very quick and easy for a week night meal, just add bread and a salad maybe!